The Tigers have parlayed the arrival of both head coach Cuonzo Martin (not pictured) and top freshman Michael Porter Jr. into a much-needed boost of excitement in Columbia. COLUMBIA, Mo. — Cuonzo Martin took over a Missouri basketball team that had finished in last place in the Southeastern Conference for three straight seasons when he was hired in March. 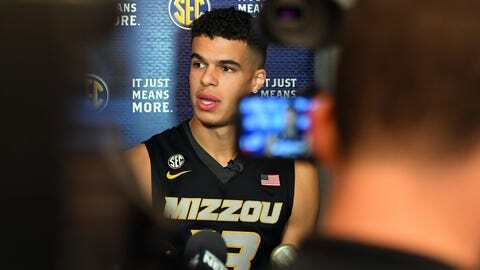 Very little looks the same with the season fast approaching: The Tigers have parlayed the arrival of both Martin and top freshman Michael Porter Jr. into a much-needed boost of excitement in Columbia. Any thought of a slow rebuild under Martin’s watch was ended when Porter — who was originally committed to play at Washington — announced he was returning home to Missouri in March after Huskies coach Lorenzo Romar was fired. The talented 6-foot-10 forward was followed by fellow freshmen Jeremiah Tilmon, Blake Harris, C.J. Roberts and his younger brother, Jontay, in signing with the Tigers. Leading the turnaround will be Martin, who left Cal after compiling a 62-39 record in three seasons. He has a $21 million, seven-year contract with Missouri. And he is close to home, having been raised two hours away in East St. Louis, Illinois. Former Canisius guard Kassius Robertson is expected to help improve Missouri’s outside shooting this season as a graduate transfer. Robertson made nearly three 3-pointers per game last season, and he averaged 41 percent on shots from behind the arc — a welcome addition for a team that was 332nd in the country last year while connecting on only 30.4 percent of its 3-pointers.